Recently I made a note of restaurants I want to visit before I turn 40, but let’s face it, this list would be a feat for anyone to accomplish in a lifetime. At the very top of the list is The French Laundry, Thomas Keller’s iconic Yountville eatery. This is a place people fantasize about, a place people stay on a perpetual waiting list for, a place Anthony Bourdain says you must eat before you die. My dad has always been in the business of making his daughter’s dreams come true, so last Saturday night he and I drove to the unassuming, vine and flowered covered laundry, and stepped inside a dream. 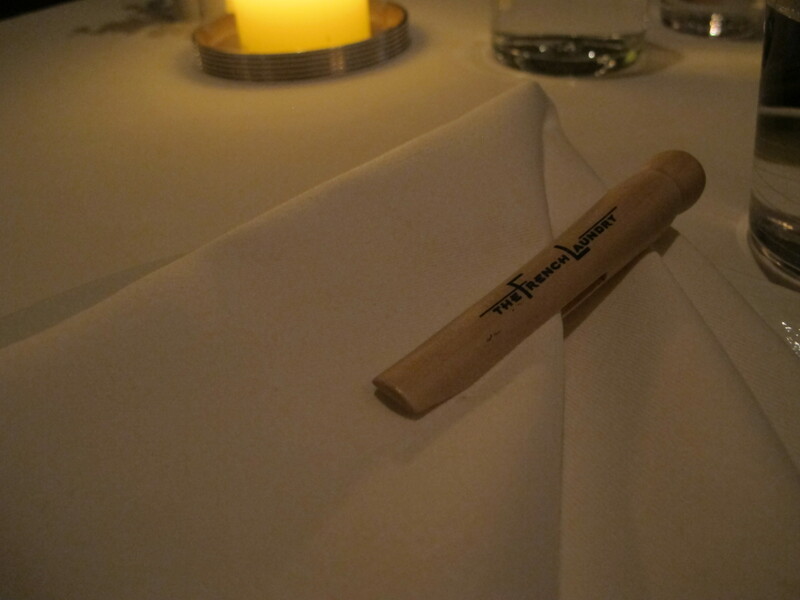 If you are expecting an ultra atmosphere at The French Laundry, you won’t get it. The garden is tasteful, the foyer is lovely, the tables are nicely dressed in plain white table cloths with clothespins clutching the napkins. As we walked to our table for two upstairs, I noted that the restaurant really does feel like an old residence made over into an upscale yet cozy restaurant. If you want ultra, just want until service starts. Our host – calling him a “waiter” would seem blasphemous – was attentive but didn’t hover, answered any questions we had, and did not flinch when we only ordered a half bottle of wine. He coordinated our meal impeccably, each course arriving at a perfect interval from the one before it. But more impressive than our own host (Dad and I were relatively low maintenance) was watching how each group of diners – an eclectic bunch to say the least – was kindly and enthusiastically served. The table of haughty, “we eat here all the time,” aristocrats got exactly the same service as the pair in the corner, who had clearly been saving up for a lifetime, and was celebrating some milestone. Anyone that had a question about the menu was given an animated explanation, sometimes including props brought in from the kitchen. For the larger tables, a line of servers marched in unison with each dish, delicately setting them at each person’s fingertips. And the food…oh, the food. One chooses between a 9 course regular tasting menu, or a 9 course vegetable (not vegetarian) tasting menu. There is also a 20 course tasting menu, but that’s only if you actually want to explode at the end of your meal. You can also check out the extensive ipad wine list, but for this meal I wanted to concentrate on food. Once you make your choice your menus are whisked away and two pre-courses are set in front of you: traditional Gougeres and the famous French Laundry Cornets – smoked salmon tartare cones. I’ve had Gougeres before, and always thought of them as dry, bland puffs. But of course, these were light yet filled with a creamy cheese mixture. The Cornets – long imitated at Cuchi Cuchi in Central Square – were a reason to visit, all by themselves. After a visit from our host with a tray of bread selections from the nearby Bouchon, we were ready to begin our meal. I’ll list the courses below, in order of appearance. I’ve only included select pictures as, unfortunately, the quality is not as good as I’d like. While The French Laundry was very generous in allowing pictures, I just couldn’t be “that guy” with a flash on my camera. 1. Oysters and Pearls – Sabayon of Pearl Tapioca with Island Creek Oysters and White Sturgeon Caviar. One of my favorites of the evening, the creaminess of the tapioca with the saltiness of the caviar and the ocean freshness of the oysters will stick with me for years. Moulard Duck Foie Gras au Torchon with Huckleberry Relish, Eureka Lemon, Tokyo Turnips and Watercress- served with toasted bread and three different types of salt. 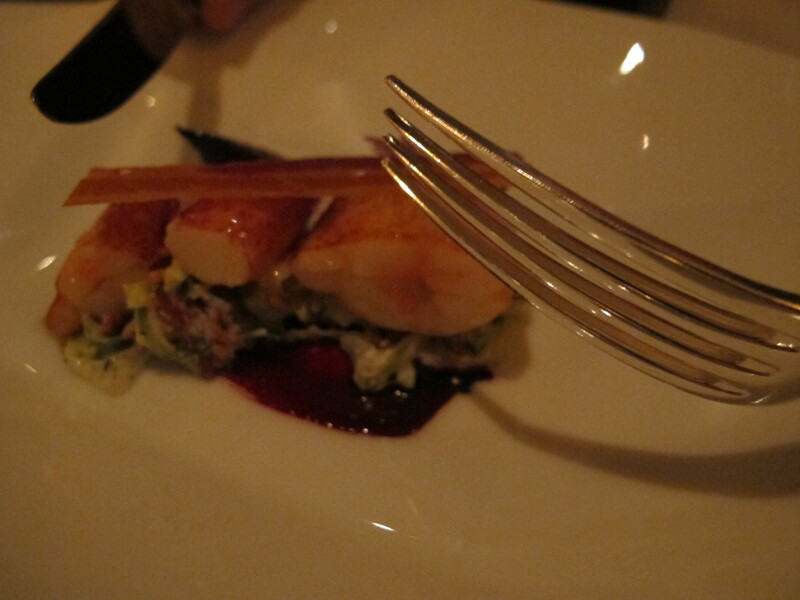 While my hearts of palm were delicious, DoSB’s foie gras was decadence embodied. The salt and bread accompaniments, as well as the huckleberry relish, cut through the heaviness of the pate to balance everything perfectly. 3. Abalone with Jinglebell Peppers, Chicken, and Corn “Pudding.” I had never had Abalone before, and this was the perfect vehicle for it. 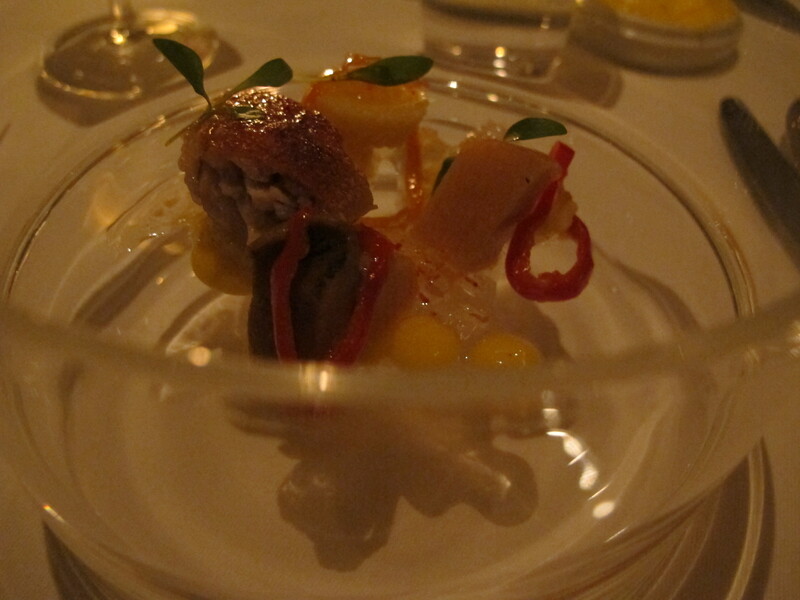 Arriving in a glass terrarium, it’s chewy texture and mild flavor was complemented by the sweet corn and smokey chicken. 4. Sweet Butter Poached Maine Lobster “Mitts” with Hobbs’ Bacon, Hass Avocado, Baby Beets, Romaine Lettuce and Tarragon Creme Fraiche. I hated this dish. I hated it because the second I tasted the absolute succulence of the lobster, I was ruined on lobster rolls for life. Nothing, nothing can compare to this. 5. Raviolo de ris de Veau with French Laundry Garden Pumpkin, Celery Branch, Black Truffles, and Sauce Blanquette with Parmesan Tuile. It was at this point in the meal that I started to slow down. The minced veal in the ravioli seemed to find every empty corner of my stomach and cling to it. 6. 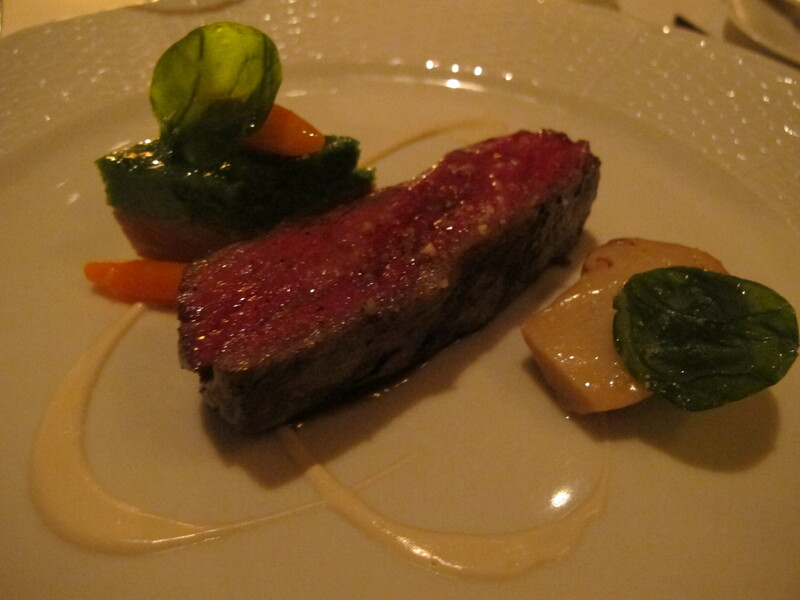 Snake River Farms Calotte de Boeuf Grillee with Bone Marrow “Pudding,” Spinach Subric, Matsutake Mushrooms, Nantes Carrots and Sauce Bordelaise. It was at this point in the meal when I started to feel euphoric. I’ve heard about runner’s highs, they say that if you eat extremely spicy food you feel a certain thrill. But it’s perfectly cooked beef that instills rapture in Sliced Bread. 7. Mimolette – Royal Blenheim Apricot Membrillo, Fennel Bulb, Nicoise olive paste, Pine Nuts and Sorrel. I was prepared to be disappointed by the cheese course, as I know Mimolette and have never been excited by its fairly bland flavor. However, this had been aged well, and accompaniments brought out flavor I never knew existed. I wish I could have bought a block of the membrillo and a jar of the olive paste. 8. Jacobsens’s Farm Apple Sorbet– Champagne Gelee and McIntosh Apple Puree. A welcome refresher, and the kind of thing you would want to eat gallons of, if you weren’t already groaning at the seams. I had the Nectarine Melba, DoSB had the Chocolate Namelaka. Both desserts were unique, not too rich, and brightly flavored with the sweet, creamy note of The End. The sliced nectarines on my melba were so crisp they snapped, and the raspberry sorbet popped on my tongue, waking up my now exhausted palate. 9+ A tray of homemade chocolates – flavored with olive oil, sea salt, peanut butter and jelly, and more – were brought to the table, as were packages of shortbread. As gauche as I knew it was, I had to ask to have them wrapped, I just couldn’t fit another morsel in my mouth. But we did relax a bit before the drive home, ordering Cranberry Orange tea that was brewed in a silver pot and brought to the table along with french pressed coffee and warm, frothed cream. It’s taken me a few days to finish the write-up of this meal because each time I begin, I start to feel full again. And I’m sure this feeling of full, decadent happiness will linger with me forever – not just because of the food, but because of the memory of the meal with my Dad, our weekend in Napa, and the fun we had together. I just hope that you two are not suffering from “Foodie Withdrawl”! Also, you should be happy to be out of here – it will be sunny & in the 80’s all weekend & next week!!! It was great to see you both – but terrible to see the Steelers!! !